As I had finished camping on the summits of all of the sevens in 2016 I decided to continue my way around the 500’s also. Slieve Loughshannagh had come into my head on that Friday afternoon while I was sat at my desk in work deciding on a camping spot for the night. I headed straight for Ott car park after work. The weather did not look very promising at all with low cloud and some light drizzle. I set off any up Ott track. Instead of going to the saddle between Slieve Loughshannagh and Carn Mountain I decided to take the lower track to get to the river to fill my Nalgene. I could then hike directly up Slieve Loughshannagh toward the summit. When I had left the car there had only been some very light drizzle so I made the mistake of not putting my waterproof trousers on. Soon after beginning to ascend Slieve Loughshannagh though the light drizzle turned into a full downpour. 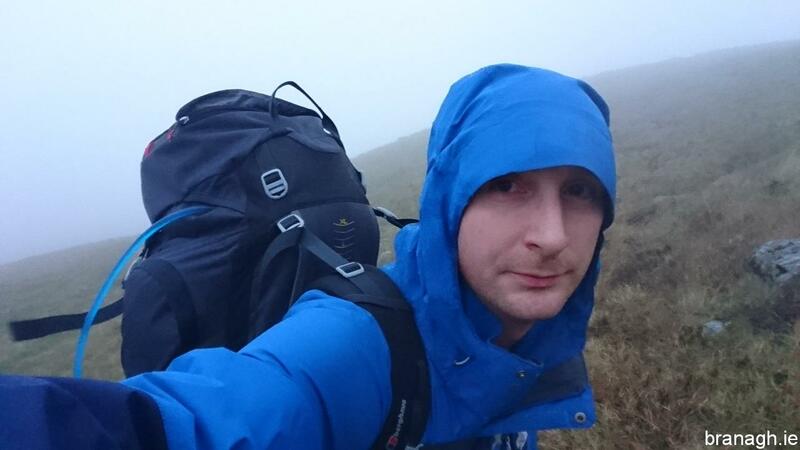 I hoped it would pass quickly so again I didn’t stop to hunt through my pack put on my waterproof trousers. By the time I did put on the waterproofs my walking trousers were totally soaked. At this point I couldn’t see my hand in front of my face and I definitely had one of those “what on earth am I doing here?” moments. I continued on upwards though toward the summit. By the time I reached the summit the rain has stopped. 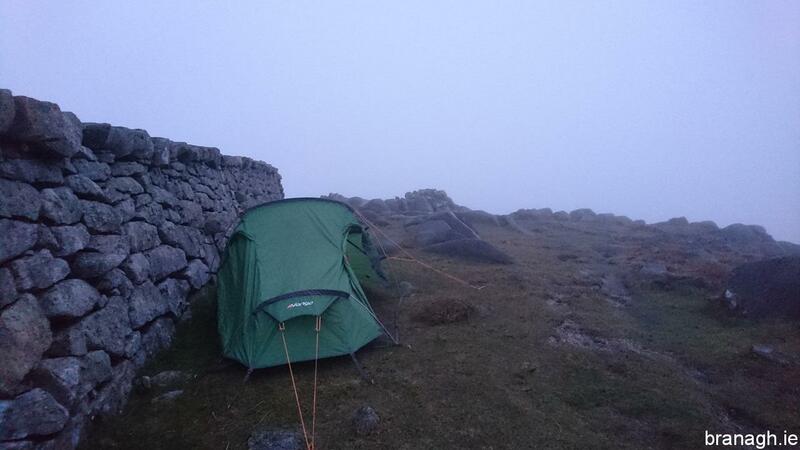 I climbed over the wall to the more sheltered side from the wind to pitch the tent. When setting out the weather did not look promising at all. I took off my outer layer while pitching the tent to try and use the breeze to dry me off a little. Unfortunately I was into the cloud at this point so there was little to no chance of being able to dry off at all so I put on a dry fleece from my pack and zipped off the bottom half (the wettest part) of my convertible North Face trousers to turn them into shorts to remove as many wet clothes as possible. This worked well as the temperature was fine for shorts. Unfortunately thanks to the low cloud I wasn’t able to see much as the light faded and he sun went down. The wind was light throughout the night so sleeping was not a problem. The summit was in thick cloud. 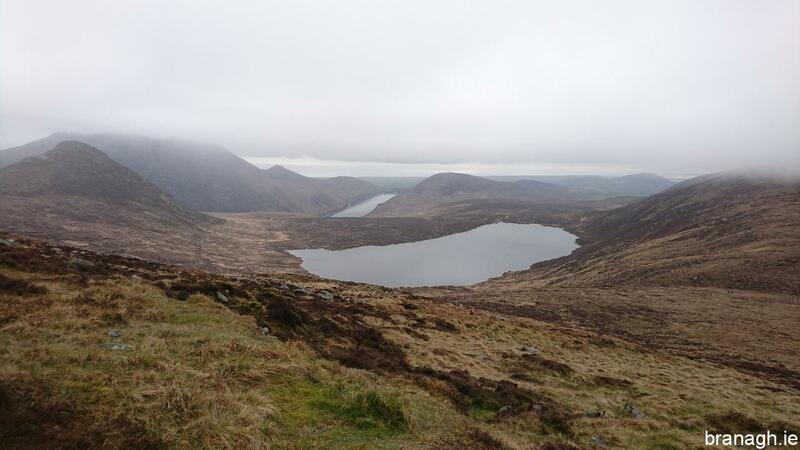 The first view of Lough Shannagh as I dropped out of the cloud the next morning. The next morning I was still surrounded by low cloud. 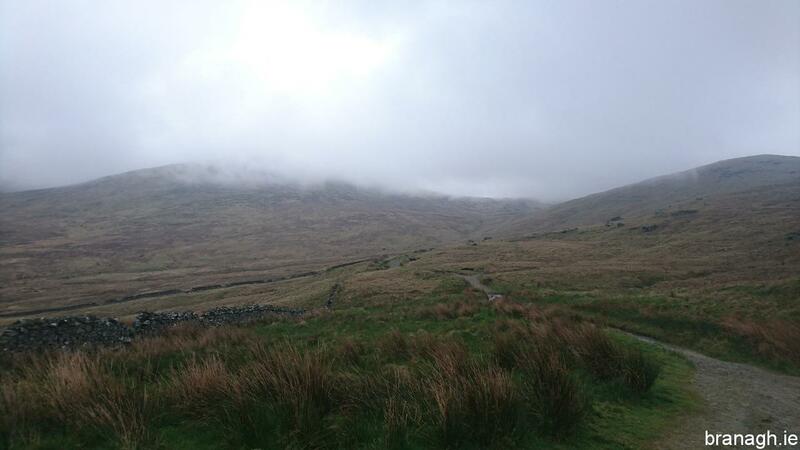 I did not peer out of the cloud until I had began to descend down along the wall toward Lough Shannagh.